Description: Maiapilo is a small, sprawling shrub with soft, light green leaves, fragrant white flowers and brittle stems. 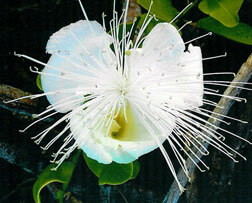 The large, white, extremely fragrant flowers look like a cross between a rose and an ohia lehua. If you removed the center petals from a white rose and replaced them with a white ohia lehua flower, you'd have a maiapilo. These night-blooming flowers usually open in early evening and wilt by midmorning the next day. Native moths pollinate the flowers at night when taking nectar, most likely attracted by the bright reflection of the flowers in the moonlight, as well as by their beautiful scent. Once the flowers are pollinated, small cucumberlike fruit, 2 to 4 inches long, begin to develop. The fruit is filled with bright orange pulp and many small, brownish-black seeds. Distribution: This exceedingly rare endemic plant is found on the coast of all the main islands, including some of the offshore islets and some of the Northwestern Hawaiian Islands. The example pictured here is one of the last known plants in the wild in East Oahu; there were two plants side by side, but the other fell victim to recent construction of a walking path. Cultural uses: Although this plant is a relative of the caper, there is no known cultural use. Landscape uses and care: This is an excellent xeriscape garden plant, as it requires little water once established. It is also ideal for moon gardens, with its big white flowers shining in the moonlight. Full sun and well-drained soil are best, and the ground should be allowed to dry out in between waterings. Be on the watch for cabbage moth caterpillars that occasionally munch on the leaves. For a limited time this plant can be found at both the town and Pearl City Home Depot stores for about $12. Tasty tidbit: We are working on a coastal restoration, planting more than 800 of these plants in an area cleared of invasive weeds such as kiawe and koa haole. In the next month we plan to add another 600 plants, hoping to return this site to the way it might have looked centuries ago. Given this plant's increasing rarity, due to overdevelopment of its coastal habitat, more areas need to be restored not only for the sake of the plant itself, but everything else that might depend on it. Rick Barboza co-owns Hui Ku Maoli Ola, a native Hawaiian plant nursery, with Matt Schirman. Contact him at 295-7777 or e-mail Rick.ck.barboza@gmail.com.